Margaret Wertheim in the Föhr Reef, Museum Kunst der Westküste, Föhr, Germany, 2012. The Institute of the Arts and Sciences will launch the UC Santa Cruz Satellite Reef project with an opening workshop on October 21 at UCSC’s Stevenson Event Center, followed by a workshop on October 23 at the Seymour Marine Discovery Center. UC Santa Cruz Satellite Reef is part of the worldwide Crochet Coral Reef project by twin sisters Margaret and Christine Wertheim and their Los Angeles-based organization, the Institute For Figuring. The project has been exhibited worldwide in both art and science museums, and is now one of the largest participatory science and art endeavors in the world. Mixing crocheted yarn with plastic trash, the Crochet Coral Reef fuses mathematics, marine biology, art, and craft to produce large-scale coralline landscapes--both beautiful and blighted. “It offers a unique response to the dual calamities facing marine life--climate change and plastic trash,” noted IAS director John Weber. The Wertheims will participate in student-led workshops to introduce the project and teach the techniques of hyperbolic crochet. The public is invited and no prior crochet experience is necessary. Their visit is sponsored by the Institute of the Arts and Sciences in preparation for its exhibition of the traveling Crochet Coral Reef in February 2017 at UC Santa Cruz’s Mary Porter Sesnon Gallery. It will feature a selection of dramatic coral sculptures created over the project's long history. There also will be a UC Santa Cruz Satellite Reef exhibition at the Seymour Marine Discovery Center, which will be crocheted by the Santa Cruz community on and off campus between now and its opening in May 2017. The UC Santa Cruz Satellite Reef is the newest addition to the Institute For Figuring’s worldwide reefing network. 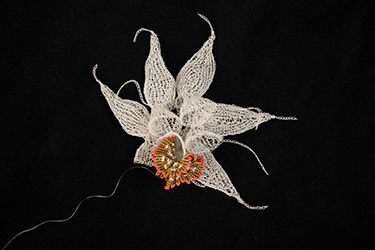 “This project, spearheaded by IAS, was inspired by UC Santa Cruz professor emerita Donna Haraway’s writings on the stunning crocheted response to global warming and its devastating effects on living reefs,” Weber noted. “Spectacularly beautiful, artistically complex, and socially powerful, the work brings people together around a devastating ecological challenge—the survival of the coral reefs and marine ecologies throughout the world. UC Santa Cruz is thrilled to be part of this galvanizing project,” he added. 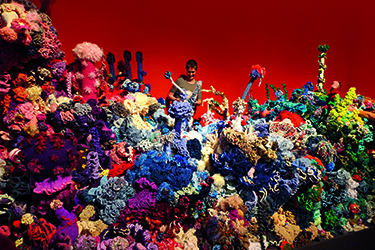 Since its first public showing in 2006, the Institute For Figuring’s Crochet Coral Reef has been seen by over half a million viewers. In addition, Satellite Reefs have been hosted in cities across the United States, Europe, Australia, and the Middle East. The night before the opening workshop, Margaret Wertheim will also participate in the Ken Norris Memorial Lecture at the Seymour Marine Discovery Center titled “Understanding Coral Reefs Through Marine Science and Woolly Sculptures.” She will be part of a diverse panel that will provide a unique perspective on corals, conservation, and crochet craftwork. For more information and a list of related events visit the Institute of Arts and Sciences web site.